A new way of making 3D mini-retinas from cells has been discovered. Stem cells can affect all parts of the body. Bones, kidneys, spines…the study of how to repair and replace these parts of the body are all enriched by stem cell. Now, another component of the body is going to get the stem cell touch: Sight. A German study published online on March 31 in Stem Cell Reports, has created an efficient way of making 3D retina organoids, which mimic the organ’s tissue organization, from mouse or human stem cells. The new mini-retina protocol involves cutting an organoid grown from stem cells into three pieces at an early stage of eye development. Each of these pieces, which look like little half moons, eventually grows into the full suite of cells found in the retina. The 3-D retinal organoids developed in this process efficiently replicate retina formation. This includes the light-detecting cone cells, which now can be produced in high quantities. Cone photoreceptors, which are responsible for high acuity and color vision, are the most precious retinal cell type with regard to potential future cell replacement therapies in patients affected by retinal degeneration. The process also allows the surviving organoids to grow to reach sizes similar to uncut organoids. 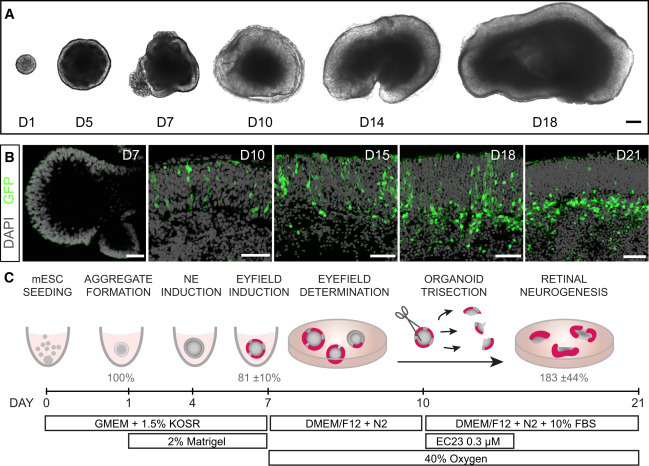 The ability to produce such cells has been a major limitation for regenerative medicine; however, this new method increases the yield of retinal organoids 4-fold, allowing us to take a great step forward in the study of the retina, and in understanding how to repair it. “The goal isn’t just to make the closest thing next to a real retina, but also to possibly harness the flexibility of the system to create more diverse ways of studying retina tissue,” senior author Mike Karl, of the German Center for Neurodegenerative Diseases (DZNE), stated in the press release.